What variety could they be? They look like Dynajec or Jacob's cattle. But the reason not bush but pole beans. Or possibly these? These are pole beans. I love Anasazi beans- discovered them years ago during a driving trip- drove by the Adobe Milling in Dove Creek, CO. It is a neat place to visit- been eating them ever since. We have a winner! These look exactly like mine. I just ordered a 10# bag of Anasazi Beans- I've been out for awhile and can't wait for my September trip to buy some! According to the website they have less of the gas-producing enzymes- and you get the most current crop of beans. Glad I could help - you have some beauties there! They are not Anasazi beans. 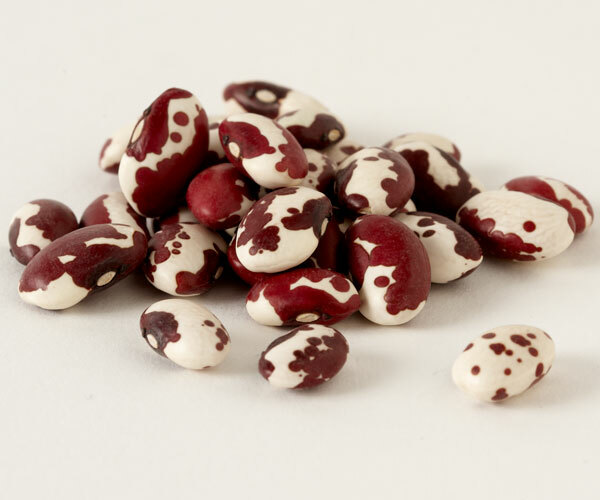 Anasazi beans will have a large solid patch of color on the top and bottom, on the majority of beans. Like Jacob's Cattle (a bush bean), this bean has the large patch only on top. There is a half-runner, Country Gentleman, that looks like your bean, too.